When writing the preface to the second edition of eMarketing, I mused on some of Quirk’s milestones. In fact, when I started Quirk almost twelve years ago, it was yet another one of my crazy entrepreneurial adventures. I had little idea back then of what Quirk would grow into today. There are key moments that stand out for me as having shaped Quirk. I count the joining of Craig Raw and Janine Carpenter and the experiences learned in building our first e-mail application in the early days of Quirk as two of them. But there is one incident that started a journey for me personally: in 2001 a fantastic man named Colin Palmer invited me to give a talk on e-mail marketing at a Direct Marketing Association breakfast. It was my first real public speaking experience and I was scared witless, but I had a lot of fun. But it was Colin’s next invitation when the education bug really bit me. He invited me to lecture to his third-year Business Science Marketing students at the University of Cape Town. I had been in that very class only two years before, so I began the lecture with a mix of nerves and excitement. Two things happened at the end of the lecture that changed me. The first was the questions from the students. Some were easy, but some really challenged me and I found myself having to think in ways I didn’t expect. The second was a student who came up to me and thanked me for the lecture, telling me she had learned something valuable. That is still one of the greatest experiences I have ever had. Sadly, Colin passed away a few years later, but I learned a huge amount from him in the time that I knew him, and for that I am very grateful. He showed me how rewarding it is to give someone knowledge; it was enlightening. Thank you, Colin. From that day on, I was hooked. I am passionate about online marketing, and I wanted to tell the world and have them share my passion. This has led me to all manner of teaching experiences, from awesome postgraduate marketing schools like Red and Yellow in Cape Town to conferences on the other side of the planet. Over the years, Quirk has continued to grow as a busy agency, meaning my time has become more and more scarce. I’ve not been able to embrace as many of the speaking and teaching opportunities as I would have liked. Thankfully, I seem to have infected many of the QuirkStars to carry the torch without me, and Quirk has become a company where we are all passionate about sharing our knowledge. Since Quirk’s inception, we have been steadily building a huge amount of informative content around the various elements of online marketing. 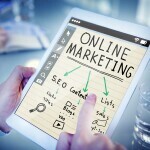 This turned into our eMarketing 101 series and subsequently the first edition of eMarketing, the essential guide to online marketing. When I read about the Open Education Declaration in September 2007, I knew exactly what Quirk should do. We needed to take all our knowledge, experience, and educational content and create a textbook that we could share with the world by licensing it under Creative Commons. The Open Education Declaration was signed in Cape Town, and it aims to accelerate efforts to promote open educational resources, technology, and teaching practices. Quirk has always been an agency fanatical about open source technology, and this seemed a perfect fit. It’s almost a culmination of everything we stand for as a company. When we published the second edition at the end of 2008, we thought we had printed enough books to last us a year, at which point we would publish an updated version with new content. Two years later, the second edition has been enormously successful: over 250,000 people have downloaded the book from our Web site, and it’s used in many universities around the world. So, in time for the 2010 first semester of the American academic year, we are publishing the third edition together with Unnamed Publisher, an open source textbook organization in the United States. The book is an update of the second edition and contains a brand-new chapter on crowdsourcing. Unnamed Publisher took the second edition of our book and, as they say, “flipped it on its head.” Their team, together with the QuirkStars, rigorously reviewed and developed the book to ensure that the content was up to date, in the right format, and of the highest standards. At Quirk, we love learning. We think knowledge makes the world a better place, and who doesn’t want to do their bit to make the world a better place? After years of pondering and wondering, we figured that the best way to do this was by putting our own years of practical experience to good use—by sharing our knowledge with the world in a neat and oh-so-pretty format so that students and marketers everywhere could benefit from it. This is the beginning of that process that needs to involve you just as much as it involves us. We have already had many students and educators sign up on our site and contribute to the growth of the book, and if you haven’t done so already, I would encourage you to do the same. With its Creative Commons license, this book is a community resource, and we need your help as our community to ensure that it’s as useful, accurate, and relevant as it can be. So once again here we are with a book that I’m terribly proud of. As I said with the second edition, it’s been much harder than we thought to put it together, with many late nights and missed deadlines, but every minute has been worth it. From the bottom of my heart, I want to thank my team and the team at Unnamed Publisher who have helped to make this idea a reality. This book is a distillation of all of Quirk’s knowledge, and to be able to offer it to all without boundaries and limitations is a privilege. I can only hope that others follow across all spheres of education and understanding. I believe education is the one thing that can change the world. It’s up to those with knowledge to do what they can to put it in the hands of others.